Comparative study of topical treatments versus surgery.Shows use of zinc sulphate at from 2% to 25% solution to cure BCC.Zinc sulphate is used also to cure toe fungal infections.PDF download at top of page. Amazon sells zinc sulphate cream.You can make your own 5% solution by adding 5grams of Zinc sulphate crystals to 95ml of distilled water. Good stuff Ric.... Thanks for sharing this and your other post on the Mandrake / Mayapple..
Zinc is one of essential trace elements and zinc sulfate has been used in many medical conditions especially skin diseases as a topical or systemic oral drug; it is used topically in treatment of severe herpes simplex infection, plane warts, melasma, superficial fungal infection and provides antioxidant photo protection for the skin. Intralesional zinc sulfate is found to be an effective therapy for cutaneous leishmaniasis, BCC, xeroderma pigmentosa (XP) and in treatment of viral warts (Sharquie et al., 2005; Punjabi et al., 2007; Heller, 1996; Sharquie and Al-Azzawi, 1996; Sharquie et al., 2007; Sharquie et al., 2008). Through an open-label case interventional work performed in 2003, intralesional 2% zinc sulfate solution has been used in the treatment of BCC (Sharquie et al., 2005). Eleven patients (10 males and one female) with BCC were included in this study; they had 100 lesion/s ranging from 1 to 46 per patient (one of the patients had Gorlin�s syndrome) (13.72 � 9.18) median of 2. Their ages ranged from 46 to 70 (61.18 � 9.60) years, while the duration of the disease was between 7 months and 36 years (11 � 11.35 � 8.49) (median: 2). A total of 100 lesions of BCC, (48 [48%] nodular, 45 [45%] superficial pigmented, 6 [6%] noduloulcerative and 1 [1%] cystic) were infiltrated with zinc sulfate solution mixed up with 2% xylocain. The sites of lesions were 43 (43%) on the scalp, 34 (34%) face, 21 (21%) cheek and 2 (2%) on the chest. The number of injections for each lesion ranged from 1 to 4 (2.06 � 0.9661) injections. All lesions showed clinical cure: 18 (18%) lesions after first injection, 52 (52%) lesions after second injection, 29 (29%) lesion after third injection, and one (1%) lesion after fourth injection. Local redness, swelling, and tenderness were observed in all lesions. After 2�3 days local necrosis with black eschar appeared in all treated lesions that stayed for 10�14 days and then fell down leaving atrophic scar. This scar gradually disappeared over time leaving a good cosmetic appearance at the end of 8 months follow up. No patient complained of any systemic side effects. Follow up for 8 months showed no residual malignant cells which proved by histopathological examination. The mechanism of action cannot be speculated, although it has been reported that zinc sulfate has local cytotoxic effects. Similarly, zinc sulfate cause local necrosis in the treatment of verruca vulgaris and cutaneous leishmaniasis through intralesional injection. So the mode of action of local injection is mainly through necrosis of lesional tissue. In comparison with other modes of injections like bleomycin and interferon alfa-2b, these drugs are associated with systemic side effects like flu like illness as with interferon alfa-2b also they take long duration to achieve healing of lesion in comparison with intralesional 2% zinc sulfate solution. In further work, topical 15�35% zinc sulfate solution was used twice daily in treatment of hundreds of BCC lesions and showed very high successful rate. Also, topical 15�35% zinc sulfate solution was applied on lesions in patients with XP and gave very encouraging therapeutic and prophylactic results (Sharquie et al., 2007; Sharquie et al., 2008; Sharquie et al., in press-c; Sharquie et al., 2009; World Health Organization, 2001; Al-Hamdi et al., 2007; Sharquie et al., 2006; Sharquie et al., 2008). Zinc sulfate solution whether through topical or intralesional way is indicated for treatment of multiple lesions, in patients that are genetically prone to malignancies like XP, epidermodysplasia verruciformis (EDV) and syndromes that are liable for BCC to malignancies or in patients with surgery phobia (Sharquie et al., 2007; Sharquie et al., 2008; Sharquie et al., in press-c; Sharquie et al., 2009; World Health Organization, 2001; Al-Hamdi et al., 2007; Sharquie et al., 2006; Sharquie et al., 2008). Most recently zinc sulfate solution 25% was reported as an effective topical therapy in the treatment of actinic keratosis (Sharquie et al., 2012). 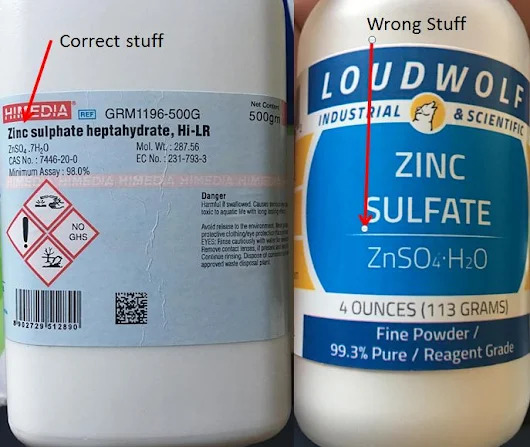 Image below is two types I purchased one being the wrong chemistry the other what was used in the study...Brands wise I have no idea which ones are "better"
Still not totally painless but at least in my case applying daily on 5 very large nodular BCC's dozens of smaller ones...a lot of AK damage.... Zinc Sulphate heptahydrate, Hi-LR is knocking things out...I've waited a week to post because I needed to be sure. There is one small lesion I have been keeping at bay for about 7 years with a litany of topicals...orange oil, watered down Zinc chloride, Vitamin C, salacylic acid, Frankincense, Petty spurge, iodine...you name it, the list goes on and on...it persisted. It was so dang small ( Unlike other ones I have ) just to the right side of my right eye at the bottom of my eyebrow... at it's biggest mabe almost a 1/4" wide and 1/8" tall...If I pressed on it it would hurt like there was a shard of glass underneath my skin..
OK what am I using.. I mixed up a 33% solution. Using a teaspoon as my measuring device. 1 "Level" teaspoon of the ZSH / 2 level teaspoons of distilled water...mixed it up and poured it into a plastic dropper bottle. If you decide to give this approach a try, I'd recommend first trying a small application on healthy skin to make sure you don't have an allergic reaction...Then if all is good , try on a single lesion and see how it feels....so you know kind of what you are getting into...If you can handle that carry on and God be with you. I'll post pictures here when the change is significant enough to post them... wish me luck and pray for a complete healing! Sounds promising, what is the best source for a quantity that fits our needs? I'm also looking forward to updates on this. We can always use another weapon in the armament to treat BCC. Some things work for some people but not for others -- or they work in one occurrence of BCC but not another occurrence in the same person. The option to hit it with a variety of therapies is therefore very valuable. Does DMSO (Have) to be used ? "OK what am I using..
First be aware there multiple types of Zinc Sulphate and I purchased the wrong one the first time I bought ZnSO4 H2O the first time.. I TRULY DO NOT WANT TO GO HAVE MY FACE CUT UP FOR THIS BUT, HAVE RUN OUT OF SOLUTIONS. IS THIS A MUCH (QUICKER AND SAFER) PROCESS THAN THE BLACK SALVE ?? Sorry for the late reply and sorry you are having some issues..
You asked: "SO, DO I LOOK FOR ZnSO4-7H2O IN POWDER OR CRYSTAL FORM OR PERHAPS SOMETHING ELSE?" It shouldn't matter powder or crystal as long as it's pureZnSO4-7H2O.. I finally gave up and pointed the domain to a picture of my tumor and listed the old site as a (history page) just too tired of trying to fix it but there is a contact form there if someone wants to leave me an anonymous message or something. So, are we back to bloodroot from nature being the actual helping agent rather than the zinc that was so often put in the poultices?? Does this now mean like one teaspoon of ZPH and one teaspoon of flour with just a snitch of DMSO mixed together in a bottle and then combed onto the area? or, does one first need to put the ZPH in a mixture with distilled water? Here's a thought anivoc, I am wondering if including orange oil to your remedy might possibly ruin the equation being as though we know it has cancer-fighting abilities on its own ? One thing I remember from high school science class was to keep items pure as possible when trying to decide on a conclusion from an experiment. Personally, I have put just straight DMSO onto my face to measure the pain factor and it was doable. I wonder if just a 50/50 solution of straight ZPH and DMSO onto the wound is a way to go ? Consider using this information at your own risk. It has to be the ZnSO4-7H2O that has caused a new and very unpleasant problem that in anything I had used previously never caused such a big issue.......the tumors randomly start bleeding and really tough to get to stop.... Over the years once in a blue moon I might get what I call a "Bleeder" that gave me a little trouble but since using the ZnSO4-7H2O it has become a much bigger problem...based on this at least in the way I am using this I would not recommend anyone else trying this...It can be a real mess...and if you happen to be in a public place (like trapped on a plane for 4 hours) pretty gross and embarrassing...ugh. Not sure what the heck will happen with the paste but I'll be finding out soon and report back..........yikes!